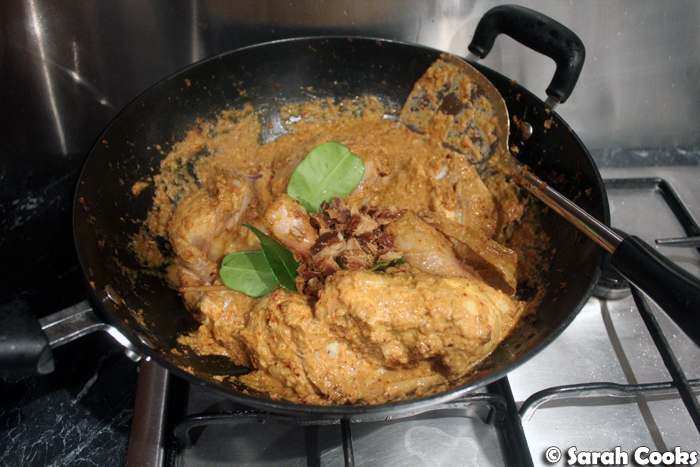 As promised, here's my recipe for chicken rendang! I wish I could say it was a secret family recipe, handed down from my amah, but I actually just found it on Pinterest. (Are you on Pinterest? Do you follow me? I'm constantly pinning random ideas for dinner parties and cakes to bake. Exciting times!) Rendang isn't something my mum cooks regularly, so she didn't have a go-to recipe - she's more of an egg curry, chicken curry kapitan and loh bak kinda woman. So, when I decided to make chicken rendang, I just searched for it on Pinterest and found a recipe that looked good and had clear pictures of the ingredients. 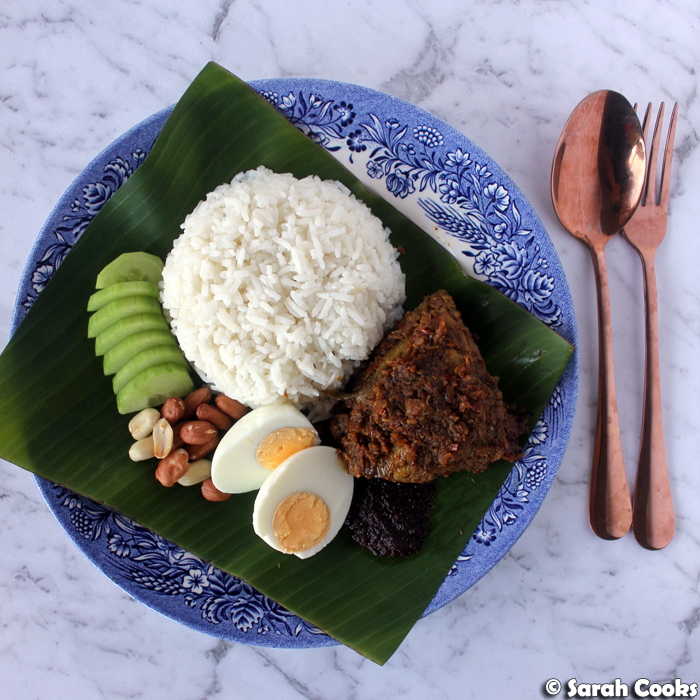 Most Malaysian recipes I see are targeted, obviously, for cooks in Malaysia, with access to typical Malaysian ingredients, and assume a level of familiarity with the ingredients and these types of recipes that I just don't have. Dried chillies - what size, what type? One piece ginger - HOW BIG IS THIS PIECE? 1.5 cup grated coconut & 1 cup water, mixed & squeezed to make santan (coconut milk) - Come again? 20 shallots - seemed excessive, until I realised it meant 20 cloves of those small red shallots! The winning recipe was this one, on Kitchen Bowl by Huang Kitchen, whose clear pictures answered all my noob ingredient-related questions. I used her recipe, making some adjustments to the method and ingredients based on what I could find here in Melbourne, and have also rewritten the recipe for clarity and with extra explanatory text. If you are a Malaysian cooking novice like me, I hope you find it helpful! 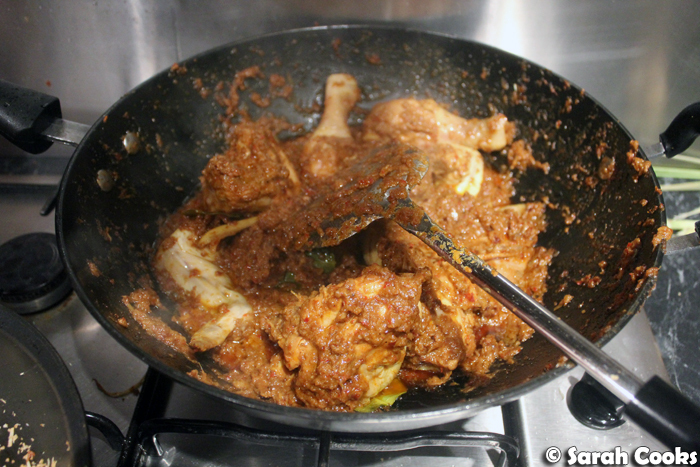 I don't do a lot of Malaysian cooking - I could never compete with my mum - and it was really fun devoting an evening to making this iconic Malaysian dish from scratch. Full instructions are in the recipe below, but basically, what you do is make a spice paste (rempah), and cook it with your chicken pieces, coconut milk and a little sugar. And you just keep cooking and cooking until the sauce is thickened and quite dry, adding some toasted and pounded coconut (kerisik) at the end for extra roasty flavour and sweetness. 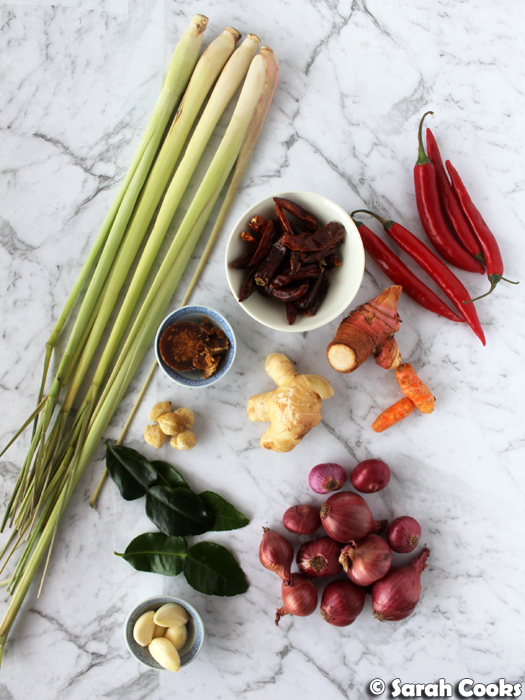 A rempah is the backbone of traditional Malaysian cooking, a complex mix of spices and aromatics. Traditionally you'd make your rempah in a mortar and pestle, but I don't have one (and didn't fancy lugging my Mum's huge stone one from her place to my place), so I used a mini-processor. And actually, you make two spice pastes - one with the dried chillies and fresh chillies (for the love of god, wear food gloves! ), and one with all the remaining ingredients. You do add them both to the wok at the same time though. Let's take a look at the cooking process! You start by heating LOTS of vegetable oil in a wok (and on reflection, I probably could have used even more! 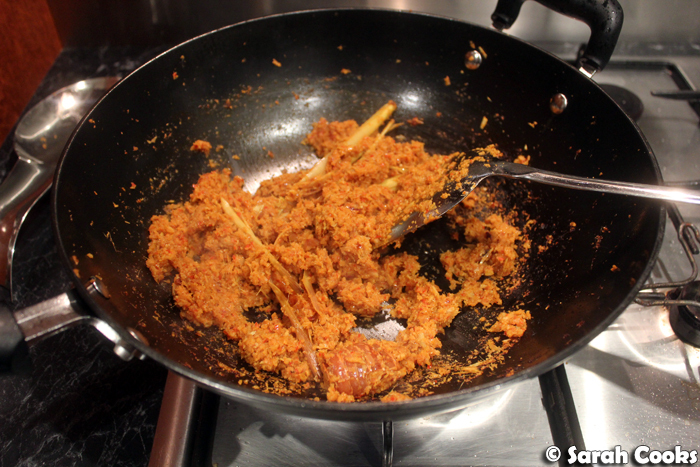 ), and frying a bruised stalk of lemongrass and a piece of galangal until fragrant. Then you tip in the rempah and start cooking! 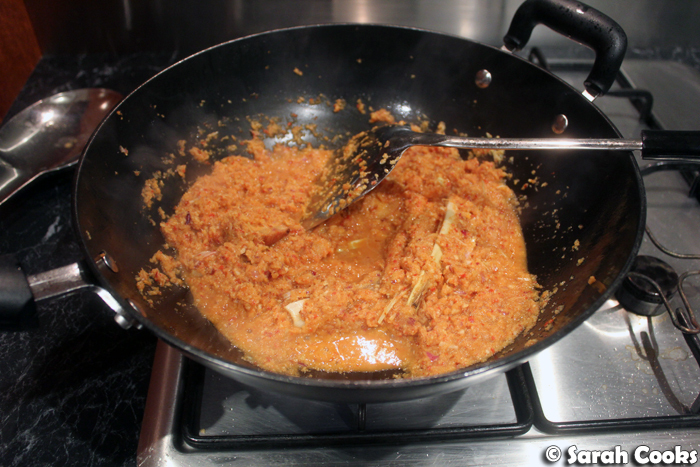 Here's the initial rempah in the wok, still quite watery. You keep cooking, the water evaporates and it starts to thicken and darken, with the flavours mixing throughout the oil. Now the chicken pieces! I bought a whole chicken and asked my butcher to chop it for me. (My mum can dismember a chicken with a cleaver; I am not that skilled). I definitely suggest using bone-in, skin-on chicken pieces, for flavour and texture. I've seen some recipes that stipulate small cubes of skinless chicken breast, and I can't see how they wouldn't just get dry and stringy. Embrace the dark meat and the skin. You keep cooking and stirring until the meat is covered in the rempah and has started to brown a little bit. (The skin won't go crispy; this is ok). And now we're sweetening it up and mellowing the flavours, with coconut milk and palm sugar (I used Sri Lankan jaggery because I happened to have been given some by a lovely friend). And kaffir lime leaves for their wonderful aroma and bright flavour. Just keep stirring, just keep cooking. The sauce will keep darkening and thickening. 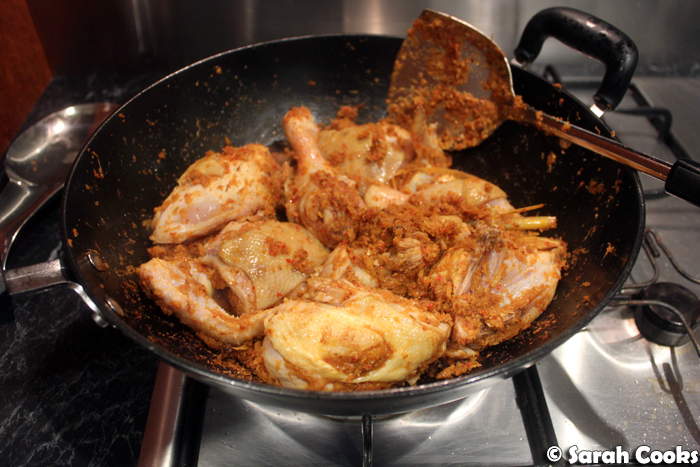 And now, the essential part of a rendang, the kerisik! It's basically toasted coconut, which you then pound into a powder or paste. I used shredded coconut from a packet, but if you're more energetic than I am, grate your own coconut, and I'm sure it would taste even better! With no mortar and pestle on hand, and my mini processor still dirty from the rempah, I used a cocktail shaker and muddler to pound the coconut, heh. Possibly should have pounded it a bit more, but that was all I could manage. The main point is to release the oils in the coconut and intensify the flavour, so it's still worth doing even if you can't get it to be a super fine powder or paste. And finally, here we are! 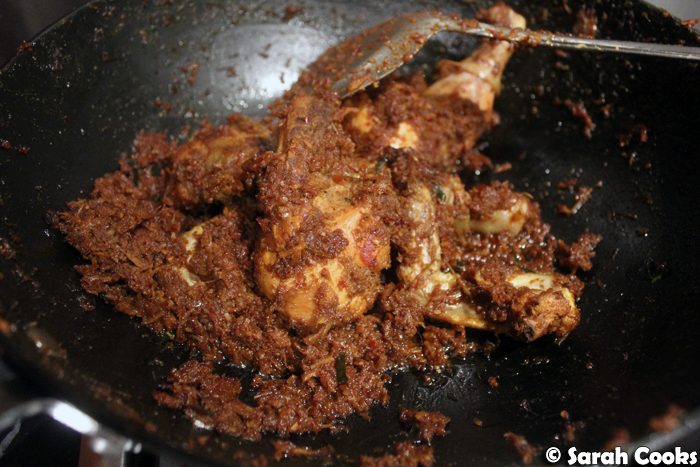 Super intense, aromatic, spicy, slightly sweet, deeeeeelicious chicken rendang! 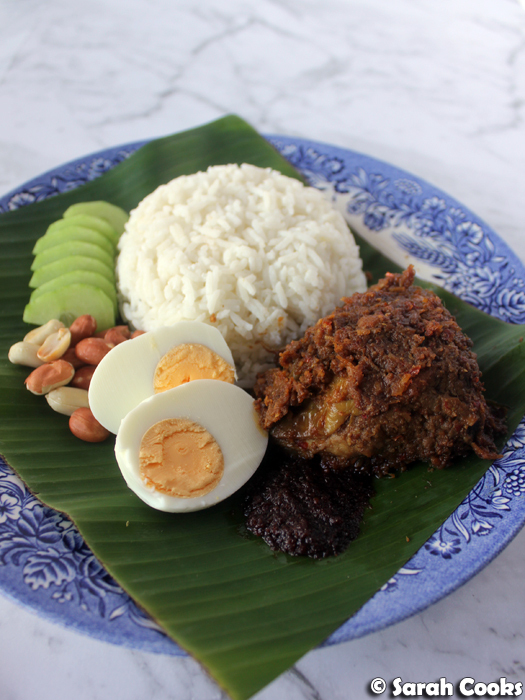 I served it nasi lemak style, with coconut rice, cucumber, fried peanuts, a hardboiled egg and sambal belacan (Malaysian chilli sauce with fermented shrimp; which came out of a jar, because there was only so much cooking I could cope with that day). I couldn't find any ikan bilis (fried anchovies), but I'll keep searching and hopefully will use them next time! I even served it on a banana leaf because I got carried away at the market when I was buying all the ingredients and thought it would look pretty. Do you like Malaysian recipes? Would you like to see more here on the blog? Let me know in the comments. To make spice paste A, first - wear some food gloves! Deseed the dried chillies by ripping off the end and shaking the dried seeds out. Place in the bowl of a small food processor or blender, and pour some hot water from the kettle over while you prepare the fresh chillies. Deseed and roughly chop the fresh chillies. Add the fresh chillies to the dried and whizz to form a smooth-ish paste. Set aside. Make spice paste B. Peel the shallots, garlic, galangal, ginger and fresh turmeric. Cut into rough chunks and place in the bowl of a small food processor or blender. Trim the ends off the lemongrass, remove the tough outer leaf and chop roughly. Add to the processor. Add the candlenuts to the processor. Whizz to combine, adding as much water as you need to form a smooth-ish paste. Set aside. Now, let's make the curry! Season the chicken pieces with salt and set aside. Peel the galangal and bash roughly to release the flavours. Trim the lemongrass stick and give it a bash too. (I didn't have any heavy implements to crush the galangal or lemongrass, so I just cut them in half). Heat the oil in a wok until shimmering. Add the galangal and lemongrass, and stir-fry until fragrant. Add spice paste A and spice paste B to the wok, and stir-fry over a medium-high heat, until most of the water has evaporated, the oil starts to separate, and the mixture has thickened and darkened. Add the chicken pieces, and stir to coat in the delicious spicy mix. Keep cooking until the chicken starts to brown. Pour in the coconut milk and stir to combine. Crush 4 kaffir lime leaves in your hand, and add to the wok, followed by the palm sugar. Mix in well. Bring the mixture to a boil, then turn the heat low and simmer uncovered for 30 minutes. Stir frequently to allow the chicken to cook evenly, and to make sure nothing burns on the bottom of the wok. 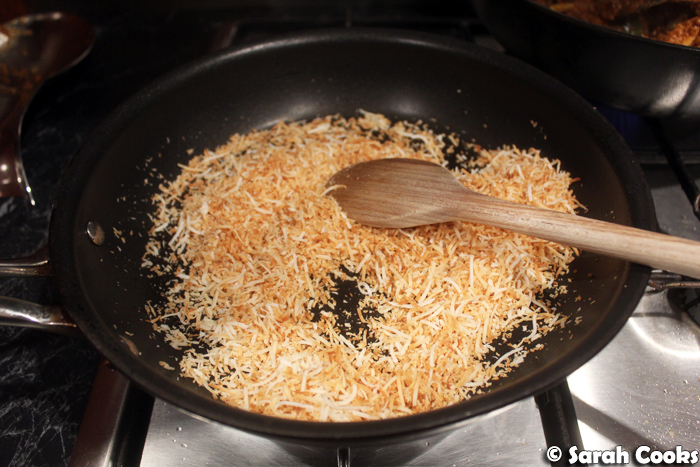 Meanwhile, toast the shredded coconut in a separate dry frying pan, until golden brown and aromatic. Pound the toasted coconut in a mortar and pestle (or use a cocktail shaker and a muddler like I did!) until as fine as you can manage. The main point of this is to release the oils in the coconut and intensify the flavour, so don't worry if you can't make a fine powder. Set aside to cool. This toasted coconut is called the kerisik. Once the chicken has had its 30 minutes, add the kerisik. Finely shred the remaining 4 kaffir lime leaves and add to the wok. Taste a little of the sauce and season with salt to your taste. Simmer for another 10 minutes. By this stage the sauce should be really thick and reduced, mainly clinging to the chicken. Fish out the galangal, the lemongrass and the whole kaffir lime leaves. 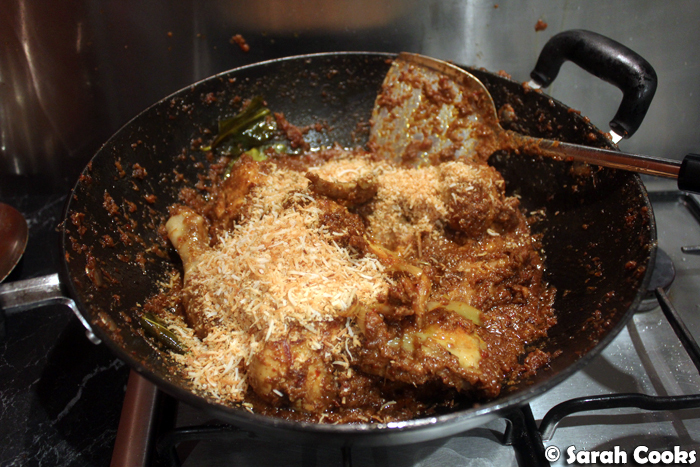 Transfer the rendang to a serving dish, and serve with rice.